Indonesia’s military: it’s business, baby! Over the past 13 years, there have been several attempts to reform the deeply entrenched practice of the Indonesian military (TNI) to self-finance. However, as discussed below, without reforms that dismantle core cultural and structural traits of TNI, change in both legal and illegal business practices will be slow and incremental. During Suharto’s presidency, such behaviour was pursued not only out of budgetary necessity, but became culturally entrenched in a military that was autonomous in outlook and considered itself omnipotent in Indonesia’s socio-political realms. To a large extent, cultural traits of TNI have been the source of resistance to attempts in the post-Suharto era to reform business practices, and have led to the consequential impotence of such reforms hitherto. There are several factors to this outcome. First, successive presidents after Suharto failed to implement reforms and enforce laws that would have weaned TNI from self-financing, particularly in illegal and corrupt practices. Second, although TNI ostensibly withdrew from the political sphere by virtue of Paradigma Baru (New Paradigm), their continued influence was demonstrated under Presidents Abdurrahman Wahid and Megawati Sukarnoputri; they played a decisive role in Wahid’s undoing and were left to self manage under Megawati. Third, while some debate on the matter was entertained under Wahid, no steps were taken to seriously dismantle TNI’s territorial command system and hence pervasive archipelagic presence. When considered in totality, these factors have led TNI to believe that, in the post-Suharto period, it still wields considerable influence and is autonomous, despite its withdrawal from a prominent public role. This belief has not, therefore, provided an ideological fissure with the past; rather it has allowed TNI to act in such a way that is in keeping with its pre-Reformasi practices. The ability of TNI to maintain its structural influence through self-financing have been further enabled by permissive environments at the subnational level. These permissive environments have been brought on through decentralisation processes (Laws 22/1999 and 25/1999) that, in the devolution of power to the kabupaten (district) and kota madya (local) levels and the reallocation of funds in the form of dana alokasi umum (translating to 25 percent of domestic revenues), have shifted money politics and corruption away from the centre. By virtue of their territorial presence, TNI have been able to access these networks and continue business practices at this level. Weak governance and accountability structures coupled with poor security have meant that illegal business activities such as logging, drug-smuggling and prostitution have been able to thrive. In order to mitigate the effects of the East Asian Financial crisis on its wealth, TNI increasingly fostered informal ties with private businesses that, at the local level, employ TNI to provide security. Many attempts at reform under the current President Susilo Bambang Yudhoyono founder on their inability to address the root causes of continued TNI business practices. One attempt to audit TNI businesses in preparation for transfer to civilian control lacked clear terminology and was hence ineffective in identifying the extent of TNI business assets. Some observers point to individuals such as former Defense Minister Juwono Sudarsono for his perceived soft approach to pushing reform under Law 34/2004 which calls for the transfer of TNI business to civilian control. Overall, these official channels have had a limited effect on addressing TNI’s whole culture of self-financing ostensibly because they target only legal practices and declared business holdings. They fail to address illegal practices for two main reasons. First, pervasive reforms on military business practices have not been framed in such a way that seeks to root out corruption and money politics at the local level. Without increased governance and oversight of local and district commands, there is little incentive for TNI to alter its behaviour. Second, and perhaps most important, is that these reforms still fail to address the deeper ideological question of why TNI’s pervasive archipelagic presence is still justified. In practical terms, one could argue that, if reduced in size, oversight of TNI could be more manageable and moreover, with a leaner military, arguably the need for extra-budgetary fundraising might be circumvented. That said, Defense Ministry and TNI officials would argue, official budgetary increases over the past few years have rectified, in part, the latter shortcoming. Returning to the ideological challenge of TNI’s territorial structure, perhaps the greatest obstacle to reform is posed ironically by Paradigma Baru. While the new military doctrine signalled a shift away from direct political meddling, it simultaneously placed greater emphasis on TNI’s role as the guarantor for national security while making clear the police were responsible for internal matters. With the police being largely ineffective (and arguably unable to demonstrate better performance with the constant presence of and rivalry with TNI), TNI has been able to put forward arguments for maintaining its territorial presence based on the fear of regions such as Papua seceding. Effective reforms must be crafted in such a way that addresses this issue but does not inadvertently allow the police to assume TNI’s place in corrupt local practices from the power vacuum created. Aside from the ideological implications of Paradigma Baru, as has been demonstrated by recent cases of torture and human rights abuses, there are practical implications resultant from TNI’s perceived right and duty to maintain its territorial presence when coupled with its culture of impunity. Overall, profound changes in TNI’s business practices will need to be approached holistically, not least in the regions in which it is allowed to thrive. While developments such as the announcement on 15 March 2011 of the “complete transfer” of all TNI holdings (except for assets such as state land) are to be welcomed, until there is complete transparency on such transfer processes, they are best seen as incremental steps rather than a fait accompli. As has been mentioned, illegal practices at the local level continue due to ostensibly structural and cultural factors that, at the outset of reformasi, were left unaddressed. Hence, veritable reform to business practices will come from efforts at dismantling territorial structures, addressing both military and civilian corruption at the local level through better governance, security sector reform, and the remodelling of an appropriate narrative for TNI that neither negates nor undermines these reform attempts. Photo courtesy of Jakarta Post. Postscript: This piece is a short essay (submitted as part of my course assessment) based a presentation I delivered on the state of TNI business practices. It provides only a cursory outline of some of the issues involved; for a more detailed examination, I direct you towards any of the books and reports cited in the footnotes. Marcus Mietzner, Military Politics, Islam, and the State in Indonesia: from turbulent transition to democratic consolidation, ISEAS, Singapore, 2009, pp. 217-219. The military doctrine of dwifungsi (dual function) that justified ABRI’s (as TNI was known during the New Order) engagement in politics was replaced in 1998 with a new doctrine that explicitly eschewed prominent and direct political involvement and promoted power sharing with civilians: Jun Honna, Military Politics and Democratization in Indonesia, Routledge, London, 2003, p. 166. Notably, TNI were left to self manage from August 2003 to October 2004 following the departure of then Defense Minister Matori Abdul Djalil (p. 227): Mietzner, Military Politics, pp. 219-227. Mietzner, Military Politics, pp. 213-214. Marco Bünte, ‘Indonesia’s protracted decentralization: contested reforms and their unintended consequences’, in Marco Bünte and Andreas Ufen (eds), Democratization in Post-Suharto Indonesia, Routledge, London & New York, 2009, p. 110: Lex Reiffel and Jaleswari Pramodhawardani, Out of Business and on Budget: the challenge of military financing in Indonesia, Brookings Institution, Washington DC, 2007, p. 21. Mietzner, Military Politics, p. 315. ‘Jakarta accused over Papua’, The Age, 23 December 2010, http://www.theage.com.au/world/jakarta-accused-over-papua-20101222-195na.html, accessed 3 March 2011. Human Rights Watch, ‘Too High a Price: The Human Rights Cost of the Indonesian Military’s Economic Activities’, vol 18, no 5(c), June 2006, p. 16. Human Rights Watch, ‘Unkept Promise: Failure to End Military Business Activity in Indonesia’, Report, New York, January 2010, pp. 4-6. Human Rights Watch, ‘Unkept Promise’, p. 4. 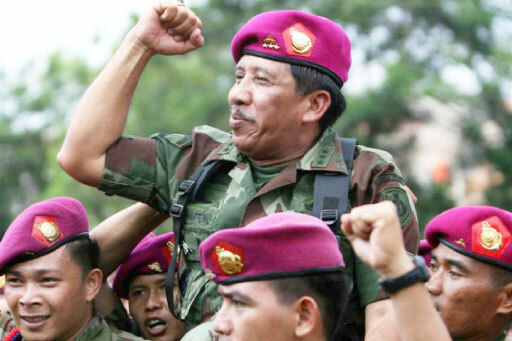 In encouraging the military to give up its business practices, in 2009, SBY pledged a 30 percent increase in the 2010 budget: ‘SBY Urges Armed Forces To Accelerate Transfer Of TNI Businesses to Govt’, Jakarta Globe, 9 October 2009, http://www.thejakartaglobe.com/indonesia/sby-urges-armed-forces-to-accelerate-transfer-of-tni-businesses-to-govt/333777, accessed 20 March 2011. Human Rights Watch, ‘Too High a Price’, p. 16. ‘SBY orders thorough probe of Papua torture video, Jakarta Post, 23 October 2010, http://www.thejakartapost.com/news/2010/10/23/sby-orders-thorough-probe-papua-torture-video.html, accessed 17 March 2011. ‘TNI assets transfer proceeding’, Jakarta Post, 15 March 2011, http://www.thejakartapost.com/news/2011/03/15/tni-assets-transfer-proceeding.html, accessed 21 March 2011. Will Australia go to war in Libya? As I write this, my RSS feeds and Twitter timeline tick over with reports of fierce fighting between Libyan and rebel forces, news of the Paris summit for world leaders, and speculation on the fighting to come. Gaddafi has undeniably broken his own ceasefire. 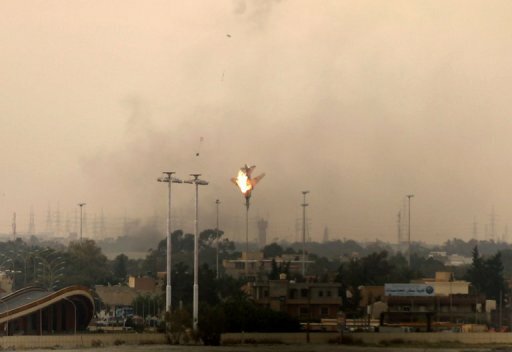 A Libyan warplane has been shot down. This will get messier still with the involvement of foreign forces, not only from enforcing a no-fly zone but also from the ground level troops required to provide tactical intelligence in support of air assets. With Britain, the US, Canada, France, Spain, Denmark and the UAE readying their fighter jets for the Mediterranean, I can’t help but wonder when Australia’s military will be dragged into the fight for Libya. Foreign Minister Kevin Rudd today ruled out the possibility of RAAF aircraft being used to enforce the no-fly zone, however I’m still not convinced that denies future involvement of Australian forces in other Libya-related operations. The Australian public would be forgiven for resisting the thought of sending our troops on other far-flung coalition conflicts, but best we consider the possibility now, and there are a couple. The first and most likely of these scenarios involves Australian troops deployed as a part of an international stabilisation force after Gaddafi’s forces are pushed back swiftly. Both Foreign and Defence Ministers Rudd and Stephen Smith are correct in pointing out that this is a matter ostensibly for NATO, however, as part of a UN or coalition mission, Australia may be requested to send troops. The second and more ominous scenario envisages a more protracted engagement with NATO and other foreign troops. President Obama will have to make good on his promise that military action will ensue if a cease-fire is not immediate; given Gaddafi is currently pushing into Benghazi, I’d say the President has few choices. While President Obama has asked for military action to exempt ground forces and be “finite”, there is still the possibility that the situation in Libya could take a turn for the worst. The UN resolution, based on Chapter 7 provisions on the responsibility to protect, mandates the protection of Libyan civilians; the door is left open for a more active intervention. In this scenario, although considerably less likely, Australian troops may contribute a small contingent for heavier fighting and more surgical tasks. While crystal-ball gazing is an undertaking fraught with danger (and I’m happy to be wrong on these points), perhaps the Australian public, wary of political underselling of conflicts such as Afghanistan, should begin considering whether some 70 years later there might be a second coming of the Rats of Tobruk. Last month, I wrote about Female Engagement Teams operating in Afghanistan, comprising American and British troops. 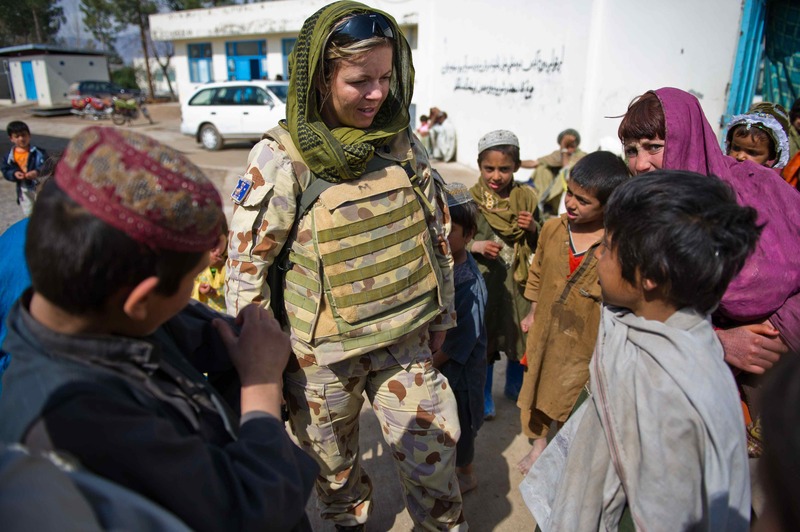 Like their NATO counterparts, female Australian troops have been deployed to Uruzgan province and, as part of the Provincial Reconstruction Team mission, they also engage with Afghan women and children. Yet little has been reported about formal Australian arrangements that mirror FET, perhaps until now. As part of recognising International Women’s Day, the Defence Department posted a short write-up of female ADF participation in Uruzgan province. The media release began by introducing FET as ISAF’s lead initiative in engaging women and facilitating development programs before turning to Australia’s bit. While the media release’s build-up left the ostensible expectation that Australia was engaged in FET-like activity, it only linked FET to PRT in stating that work was done in “close conjunction” and that one PRT member had participated in a FET with a female interpreter. While it is commendable to see more Australian female involvement in the military, especially in Afghanistan, that the bulk of this write-up consists of largely other nations’ initiatives (and our fleeting engagement with them) is rather sad. It exposes a lack of creativity in utilising our female personnel. Some may argue that our contribution of 1,550 is modest and, thus, does not necessitate a prominent female program. However, I would argue that is not the point. We have female personnel in Afghanistan and if we wish to promote in particular their ability to engage with Afghan women, let’s not wait until International Women’s Day and only do so on such an ad hoc basis. Lately, there have been a few stories about dogs in Afghanistan. 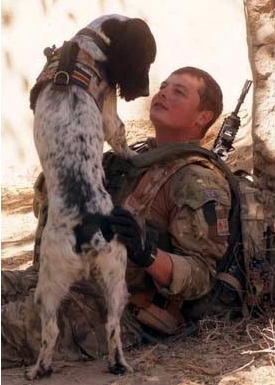 One of the most touching has been that of British IED-detection dog Theo (pictured right) who allegedly died of a broken heart after his master, Lance Corporal Liam Tasker was shot in action this week. 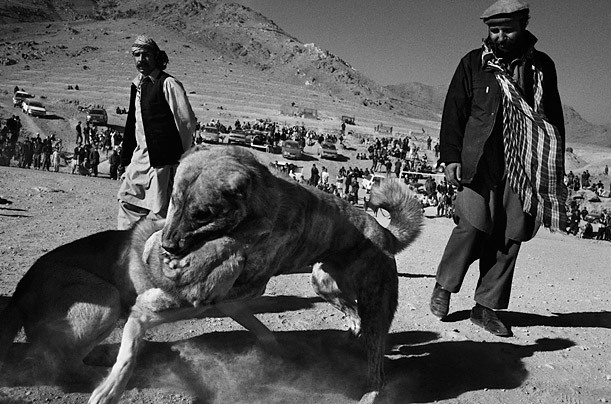 Animals are a welcome inclusion in the narrative of the Afghanistan conflict. Even sad stories such as Theo’s illustrate the selflessness, stoicism and loyalty of dogs on duty. Dogs can be a good news story that lift (or distract) public sentiment about a conflict. Yet sometimes, the good tends to overshadow the reality of a dog’s life in war zones. In this post, I wanted to explore not only the good, but also the bad and ugly of life for man’s best friend in Afghanistan. The Bad. First, there are obvious physical risks to dogs deployed to combat zones, and many, like Theo, do not come home. Some die not just from wounds sustained in explosions—one of the vicissitudes of their line of work—but also from heat stroke, friendly fire, being run over, or, in the case of one US hero, being accidentally put down. 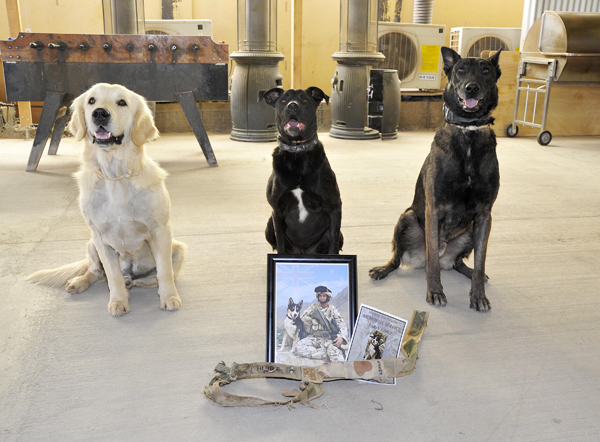 Australia’s most recent canine casualty was Herbie (whose mates are pictured left, attending the memorial service of their fallen comrade in Uruzgan), killed alongside his handler Sapper Darren Smith in Afghanistan last year. Second, the danger is ever increasing; now it appears the Taliban are offering bounties to snipers for killing dogs and their handlers, leaving their patrols vulnerable to explosives and no doubt, diminishing morale in the process and scoring a PR win. Once their deployment(s) is over, these dogs are cared for in hospitals (examples include the Defence Animal Centre in the UK and Holland Military Working Dog Hospital in the US) or, if they are lucky, adopted. And the Ugly. The plight of ordinary Afghan dogs, relative to their military counterparts, is a secondary consideration; a foreign media curiosity at best, a problem too hard to solve at worst. Sure, they’re not actively protecting soldiers and dismantling insurgent threats but they too are caught up in a post-9/11 Afghanistan. Despite being banned under the Taliban, the practice of dogfighting in recent times seems to have flourished (incidentally, their ability to draw crowds has made them a popular target for recent bomb attacks). Although not supported by all parts of Afghan society, owners defend the practice, arguing that the dogs are well fed and, unlike in other countries, the dogs are pulled apart and not fought to the death. What does the case of Afghanistan tell us about how we value these animals? Military or “civilian”, the case of dogs in Afghanistan shows that, at the end of the day, dogs are a cog in the machinery of man’s life. Sometimes they pay the ultimate sacrifice whether we wage war or win wagers. Their further make their contribution as a part of the propaganda campaign of conflicts: the timing of announcing Sarbi’s return with then Australian PM Kevin Rudd’s visit to Afghanistan was not lost on the Australian media. Given the dearth of information on Afghanistan, why not a good news story about a long lost canine? While womens’ rights are currently being compromised to further peace talks in Afghanistan, I am pessimistic about animals’, particularly dogs’, rights there. In any case, we should take a moment to respect the lives and contributions of war dogs everywhere. After all, for many, it truly is a dog’s life. Post script: More more on war dogs, please see War Dog of the Week on Tom Ricks’ blog. For further information on Military Working Dogs in the ADF, please see the Australian Defence Force Trackers and War Dogs Association. For further information on animal welfare groups in Afghanistan, please see Nowzad Dogs.